I have been freelancing for a few years, and putting in such long hours has taken its toll on my back. I’m wondering if you have dealt with this problem in the past. If so, have you acquired any secret tips or tricks for easing back pain while maintaining a full workload as a freelancer? Stretching – once a day for at least 10 minutes. I use a combo of stretches I’ve learned along the way and some yoga. Try MyYogaBlog by Ursula. She says: Just being ordinary is immensely beautiful. I suspect if I spend more time at it I’d get even more benefit. 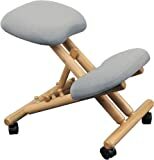 I sit on a kneeling chair sort of like the one in the photo, and I also sometimes use an exercise ball to sit on. Regular chairs and I don’t get along well anymore. But the biggest single tip I can give you is stand up and move away from the computer at least every two hours, and preferably every hour! It’s worth learning more about ergonomics at the computer. One good source is OSHA (Occupational Safety and Health Administration). Ergoblog publishes info on products and ideas that can help freelance writers and others who spend hours at the computer. How do you avoid back and other pain at the computer? Good tip… http://e.ggtimer.com/ is a simple online timer I use. These are great tips. Thanks for taking the time to post. I will be making some changes today! The biggest change I’ve made is actually taking time to stretch. At first I had to remind myself to do it, but now it’s becoming habit and it is certainly helping. Works for me too… I wonder why I have to work so hard to remember something that feels so good. I had quite a bit of shoulder pain in my right shoulder – computer mouse-related. I moved the mouse to the left side. Presto! No more pain. What’s more, I have no pain in the left shoulder, either. The left side of all keyboards isn’t cluttered with multiple rows of keys, so the reach for that arm is smaller (try it). It takes a little getting used to, but I can’t imagine working with the mouse on my right side anymore. .-= Lori´s last blog ..Favorites and Sure Things =-. I’ve done that from time-to-time… I also think doing something like working with the non-dominant hand can open creativity. A friend, who is also a freelance writer, just put together a free ebook with lots of exercise tips, plus how to choose pain-free chairs, keyboards, and mice. (Hope this is OK to post). .-= Jodi Kaplan´s last blog ..Is your offer any good? =-. When I was still in the corporate world, I had someone who worked in our workers’ comp area come by and do an ergonomic assessment. It made a huge difference. At the time I was having severe pain in my wrist (not carpal tunnel but equally as painful). I also had back surgery 100 years ago and it lets me know when I am abusing my back. 2. Our legs should be at a 90 degree angle with feet flat. Too much one way or the other puts a strain on the back. Your knee chair intrigues me. Where did you get it? Do you have a website we can take a look at? Getting up-even for a few minutes-is the best advice, as you noted. If I don’t do that, my operated-on back screams at me when I finally do get up. 3. Move your mouse from your shoulder joint-not your wrist. In other words don’t do a side to side motion with your wrist. He actually was against mouse pads with rests because it causes you to move the mouse from the wrist. After I threw that out and tried the motion from my shoulder joint, my pain never returned (and I had previously had 2 shots of cortisone). Even better is if you get less mouse-dependent (shortcuts, etc.) Alas, I am old-school & the habits are really hard to break. 4. Your arms should be at a right angle to the keyboard. Too many people put their keyboard on top of the desk or have it raised where in essence, your hands are reaching up. It kills the wrists, shoulders and can strain the back. It helps if you have someone take a look when you’re setting up your work area because what you might think is 90 degrees, really isn’t when you step back & look at it. .-= Cathy Miller´s last blog ..COBRA Frustrations =-.